But it can be revived. Don’t you quit on me, damn you. Don’t you quit. 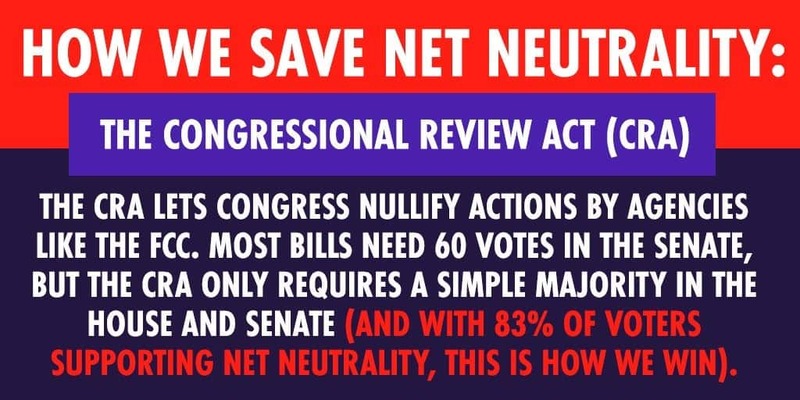 There are fights to save net neutrality going on even now, at every level of the United States government and civil society from the federal government down through state, city and local legislatures to neighborhood associations, campaigning groups and individuals. We’ve lost a battle. Not the war. The most recent victory against the dark side was a narrow win in the US Senate ( 52–47, thanks to Republicans Susan Collins of Maine, John Kennedy of Louisiana, and Lisa Murkowski of Alaska). That leaves a fight ongoing in the legislative branch to preserve net neutrality by blocking the FCC’s order. After the Senate passes it, it goes to the House, and after they pass it, it goes to the President. So we have two jobs. 1: Make it pass the House. The House doesn’t fancy a fighting piece of legislation; this isn’t business as usual. But the evidence suggests that we can pressure them to act right. For the House to pass it we will need to get some Republicans to vote for it. They make up 248 of the House’s 435 seats, so a vote on party lines will let the CRA die. Republican Senators crossed the aisle; can we persuade Representatives to? You want this guy – the Rep, not the Sens. If your Rep’s a Republican, call them. If they’re a Democrat, call them. If they’re independent? Call them. Email them and tweet them while you’re at it. There’s overwhelming bipartisan public support for an open internet, and hundreds of thousands of American jobs and businesses depend on a level online playing field – it’s your pocketbook and your paycheck, as well as your rights. Let them know it matters and you’re watching. After the House passes the bill, the President has to sign it into law. He has the right to veto. If that happens, Congress then votes to override the veto. That’s a stiffer vote. The CRA requires only an absolute majority. The House can send it to the Prez for a John Hancock on a 218-216 majority. But to override a presidential veto, the Senate and the House both require a two thirds majority. So we should quit, right? No. This has the potential to be a defining issue. Whichever side of an argument you happen to be on – liberal, conservative, libertarian, socialist, yogic flyer, whatever – you either want a fair discussion, or you don’t. In a sense, the people who want a level playing field – an open marketplace of ideas – are all on the same side, because they ultimately want to let you decide what you think for yourself. The people who want to control what you’re allowed to see, hear, say and think are on the other side. Drawing those battle lines clearly and standing up for our freedoms online isn’t a waste of time – even if we lose this battle. And there are parallel fights going on at the state and local level too, which we’ll get into in another post. Meanwhile, if you want to protect yourself from many of the negative effects of the death of net neutrality, you could do worse than getting a VPN!